Turkey's Post-Coup-Attempt Purge Widens As Arrests And Firings Grow : Parallels Turkey has detained or dismissed thousands of people from the government and the military in what many see as the president's attempt to seize even greater powers. 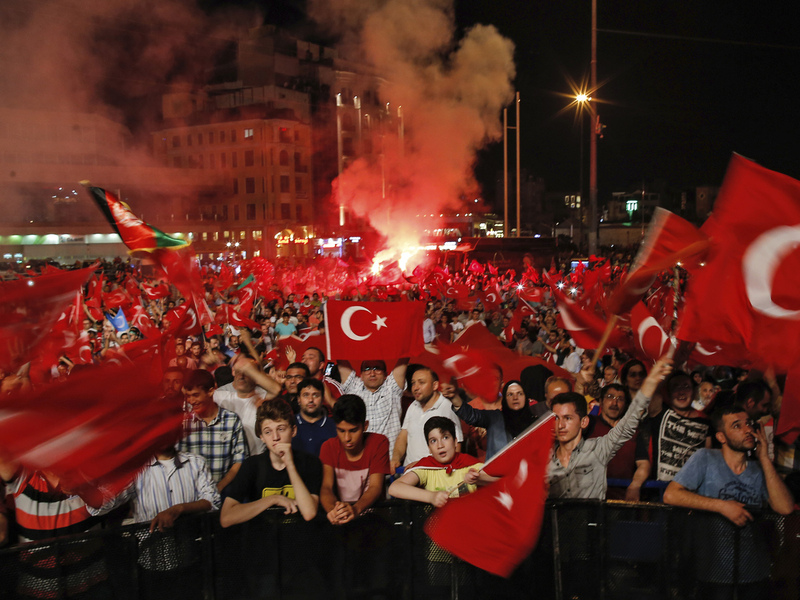 People wave Turkish flags Tuesday as they gather in Taksim Square in Istanbul, protesting against the attempted coup last Friday. The Turkish government accelerated its crackdown on alleged plotters of the failed coup against President Recep Tayyip Erdogan. Turkey's government says it is removing from government institutions anyone it considers loyal to Fethullah Gulen, an elderly Turkish cleric who has been living in eastern Pennsylvania since the late 1990s. Turkish officials are blaming Gulen, who has a large following inside and outside Turkey, for a failed coup last Friday, an accusation Gulen denies. Meanwhile, the broadcasting licenses for at least two dozen Turkish radio and TV stations have been canceled for alleged links to Gulen, whose extradition Turkey says it will seek from the United States. So far, more than 18,000 people have been sacked across Turkey's government institutions, according to the state news agency. More than 7,500 people have been arrested or detained. The international community is condemning the attempted coup against an elected president, Recep Tayyip Erdogan, while also calling on Turkey to uphold the rule of law. What is the Turkish government saying about all these arrests and dismissals? The government says it survived a bloody takeover attempt by "terrorist" elements in its institutions, and now wants to remove them. Erdogan has referred to it as a "virus." Turkish television is showing frequent footage of detained suspects being walked away by authorities. "You have to understand that we survived a coup — we could have been killed," Ibrahim Kalin, a spokesman for the president, told foreign journalists in Istanbul. "I personally could have been killed and many people that you see now making statements could have been killed or arrested or put in prison. So you have to understand the psychology here." What Are The Economic Effects Of The Turkey Coup Attempt? He says the government appreciates world leaders who have condemned the attempted overthrow of a democratically elected president. But, he adds, Turkey is following the rule of law. He also says the conspiracy theory that Erdogan staged the coup is "nonsensical" and compared it to conspiracy theories that the terrorist attacks of Sept. 11, 2001, were carried out by the U.S. government against its citizens. Kalin also said the number of people detained is high — and may rise further — because of the scale of the plot. "The people who carried out this coup, who killed people on the streets, who rolled the tanks on civilian people, they are arrested," he said. "If their numbers are 3,000, 5,000 or 7,000, it doesn't matter — they will be arrested and prosecuted." What are government critics saying? Many critics are asking how so many government employees or appointees could have been involved in a coup without the government getting wind of it. They say Erdogan is using the attempted coup as a way to justify getting rid of his opponents. Some 15,200 people have been fired from the education ministry and 257 were fired from the prime minister's office. Judges and prosecutors have been fired and detained, 1,577 deans of private and public universities were asked to resign, 1,500 people from the finance ministry were dismissed, 877 people from the interior ministry, 100 from the intelligence agency. And the list goes on. Some local media outlets put the numbers of those dismissed or detained at some 50,000 people. "We already stated that we expect that the follow-up of this event [the attempted coup] should be along the international rule of law standards," European Union Commissioner Johannes Hahn said. "What we see is that this is not yet met." Turkey is not a member of the EU, but would like to be. Why Is A Cleric In The Poconos Accused Of Fomenting Turkey's Coup Attempt? In a statement, Zeid Ra'ad al-Hussein, the United Nations' high commissioner for human rights, voiced "serious alarm." He called for fair trials and the rule of law. "In the aftermath of such a traumatic experience, it is particularly crucial to ensure that human rights are not squandered in the name of security and in the rush to punish those perceived to be responsible," Hussein's statement said. The White House issued a statement Tuesday saying that President Obama spoke with Erdogan and "urged that the investigations and prosecution of the coup's perpetrators be conducted in ways that reinforce public confidence in democratic institutions and the rule of law." How much more do we know about the coup? The military issued a statement Tuesday saying Turkey's intelligence agency got word something was going on at 4 p.m. Friday. Then, presidential spokesman Ibrahim Kalin says, within hours the military chief of staff was taken hostage. Erdogan told CNN in an interview on Monday that he could have been killed if he'd stayed another 10 to 15 minutes at the hotel where he was vacationing with his family in Marmaris, on the Mediterranean coast. Men went from room to room at the hotel looking for Erdogan, the spokesman said. A video of the attack on the hotel was aired on local television. What's it like in Istanbul now? Every night, people still go into the streets, as the president has asked. They honk horns, wave flags, chant religious slogans, play music. It's quite festive. But you can also see the divisions. On Istiklal Street, which leads to Istanbul's main Taksim Square, you can see people watching, some uncomfortably. One café worker curses them every day as they pass. He doesn't like Erdogan. He thinks he's cracking down on freedoms and dissent and he would have been happy to see him go. Every day, funerals are taking place for those killed. The death tolls given by officials range from 230 to more than 300. The numbers include those involved in the coup, as well as civilians and security forces loyal to the president. The Turkish government says those who are believed to be involved won't be allowed a religious burial, according to Turkey's state news agency. And Turkey can decree this — because the Religious Affairs Directorate employs all 75,000 imams in Turkey's mosques.